The smoked paprika really made the gravy look interesting. Each year I try and find something different to have with our Thanksgiving meal. In the past I’ve been selfish and bought something only I would drink like Dogfish Head’s Raison D’Etre. One bottle is not enough to share. Not very friendly. (Still be a possibility with the leftover turkey this year). This year we have the Mrs. Dan-in-Laws coming. I better have enough to share. We are also planning our annual Turkey Day Throw Down where me and Mrs. Dan compete to see who makes the best turkey or side dish. Last year we did side dishes and even Mr. Ben competed with Atomic Mac ‘n Cheese. I just realized I never posted the winner (that would be me) from last year or the wine review. I’ll have to polish it off and post it. I digress. We might include the Mrs. Dan-in-Laws in the competition. Which means we’ll probably have 5 parts of the meal being completed at different times over a four-hour period which will result in chaos and cold food. Once again I digress. There is a wine review in here somewhere. I received a bottle of Hans Michel Gewurztraminer from the kind folks at Lidl. This is a wine right up my alley at $8.99. 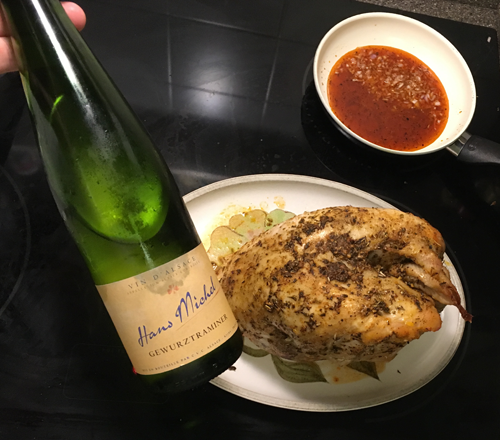 I didn’t want to risk the meal with a wine people wouldn’t like… and this allows me to cheat and get a head start on my turkey recipe for the Throw Down, I bought a 4.5-lb frozen turkey-breast from Publix (around $7.50) and did a trial run complete with the Hans Michel Gewurztraminer this past weekend. If you are already bored then I’ll jump to the chase so you can go walk the dog or get back to work. The Hans Michel passes muster for the Thanksgiving meal. It is a really nice wine, especially for $8.99 which is about average for French (or American) Gewurztraminer in the area. A German Gewürztraminer sometimes runs around $10. When I sipped it cold straight out of the refrigerator I tasted melon and apricots. A bit of acidic spritz up front and a bit of a mineral finish. As it warmed the wine it seemed smoother on the palate. Not quite a buttery feel but approaching it. The apricots were still there. So, to me this is a semisweet wine. To some this would be a sweet wine. And if it is then they’ve never tried and compared it to Schlink Haus Red. That is sweet. Mrs. Dan gave her thumbs up but with some observations. She said it was “perfumey”. Which I find appropriate as I turned to our friends at Wikipedia to find out about Gewürztraminer. In German it basically means “Spice Traminer “or “Perfumed Traminer” (Traminer is a white grape that typically is sweet and I won’t bore you with the details. This is getting long enough). If you notice I’ve referred to this wine two ways, with the umlaut (“ü”) and without (u). The Lidl Wine Guide uses the umlaut (“ü”). In France, where Alsace is located, they drop the umlaut. The label doesn’t use it either. The German’s do so I’m trying to keep my references straight (If it’s in Wikipedia it has to be true… right?). Once again I digress. I like this wine because it does have some sweetness to it but is balanced with the acidity. This will pair up with just about everything on the table. It’s like cranberry sauce in a bottle but without the cranberry taste. I prefer wine over cranberry sauce at any meal. I think that minerality that I and Mrs. Dan detected was the “bitter almond” they referred to in the guide. I’ve done my due diligence. I have scoped out a wine for Thanksgiving that should go nicely with the bird. And it fits my budget nicely. And for those who care this is a non-vintage wine. There’s nary a date on the label. About the test bird. I took a simple recipe from Allrecipes.com. It seems there are separate recipes for turkey breasts vs. a whole bird. I pretty much followed the recipe but upped the ingredients a bit since I had a 4.5 lb breast instead of the called for 3-lb. It also took half an hour longer to cook (I used a remote thermometer to track the progress). Please note. Always read the labels carefully. We have about 5 bottles of paprika in the spice cupboard (why is a mystery into itself). I managed to grab the one bottle that was smoked paprika. Trust me, there is a difference. But in the end it made for a different flavor and that might just be the secret ingredient that helps me win this year’s Throwdown. Also, don’t believe the recipe on the part where it says “rub the butter/spice mixture over the outside.” Ain’t happening. Unless you spray the bird with paint primer that butter ain’t sticking to nothing. I tried drying it. Nope. I had a 1/2 cup of congealed butter on my hands. I eventually got enough scraped off and got it under the skin, which does work. I then melted the reserved butter it a bit and poured it over the bird at the 1 hour mark as instructed. Turned out pretty good and we had turkey for several days for meals. Nice and juicy. The smoked paprika made the gravy really stand out. So, if you give this a try for Thanksgiving I would love to read your comments… but only if they are civil and you agree with me.